Gust Janson requested an exemption from the draft on the grounds that he was his wife’s sole support, but that was rejected. Then he filed an “industrial exemption” request, apparently on the grounds that he worked in a key industry. Yet both this request, and an appeal of the first request, were rejected by the draft board. 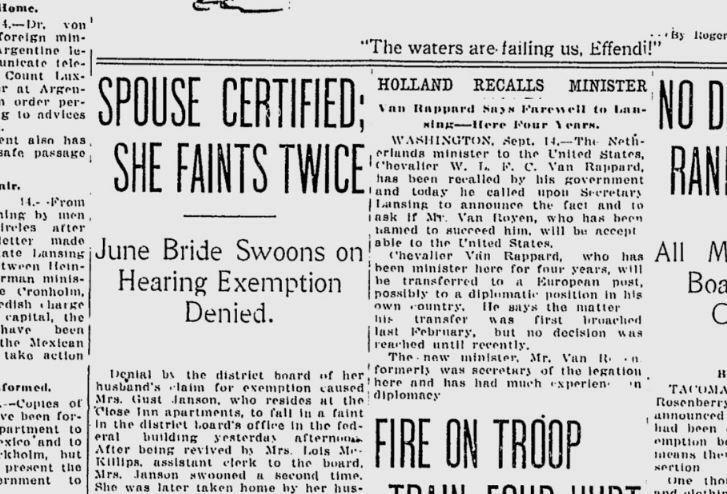 Mrs. Janson, upon hearing the news in the office, “turned and fell.” She had fainted dead away. She was revived briefly. But then she fainted a second time, and this time she remained unconscious for nearly 20 minutes. The couple had been married only two and an half months. From the parks beat: The baseball stadium in Peaceful Valley was about to get a new name: Glover Field. Civic organizations had urged that the field be named in honor of James Glover, partly because of his status as one of the fathers of Spokane, and partly because it sat on one of Glover’s early land parcels. The field remains a Peaceful Valley landmark today, called Glover Field Park.